All products come with a 12 month warranty. Please see section 8 here for more information. Rating: 5/5 based on 20 review(s). 1220 people have bought this item! Please note only the red/white and black/yellow Skipper Retractable Barrier Tape Holders are stocked. The blue/white and bespoke skipper units are made to order, please call sales on 01737 783101 for details! Great service from point of ordering to delivery of my items. I ordered my parts on the Thursday and got them the next day. I will definately use them again. Simple to deal with and cheapest by far! easily trackable once ordered, required urgently and delivered next day. The unit itself very clever design and perfect for sealing off designated areas esp if you order the wall magnets that the barrier clip into. Impressed. Makes barrier adjustment a breeze when moving around work area. Much better than the traditional plastic tape. Great job thanks, excellent product with asap delivery. Its an innovative barrier product, very clever design. I had not used Skipper barriers previously but they work very effectively for areas where you need to cordon off and really straight barriers are too big and bulky. we had tied barrier tape to cones before but it was not strong enough and used to flap about in the wind. The tape within the skipper barriers are far more sturdy. very good. arrived next day and at a good price. Very good product nicely designed and easy to use and set up. Would recommend to others. aT A fraction of the cost of other companies, found this company reliable and cheapest on the skipper barriers too. Best price we found online, were a little sceptical actually at how cheap Sitebox were compared to other companies and how quick delivery times stated. But neednt have worried the skippers arrived duly next day and I have recommended the site to others, thank you! 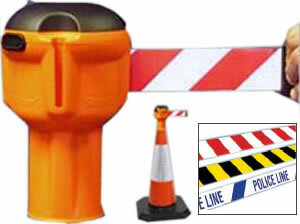 JSP Setting Out Peg (24" or 48")/ Profile Board (3 . . .
Skipper Retractable Barrier Tape Holder - with 9m . . .